French manufacturers Arturia are no strangers to innovation. Known for their gnarly Brute synth range and all-encompassing controllers, they produce some of the most popular music tech gear on the market. But nestled in amongst their intimidating line up is a relatively unassuming little MIDI controller that you’d be forgiven for glancing over in a music shop. …and breathe. If you’re still not convinced, keep reading. Here are our reasons, in full, why we think the Arturia KeyStep is an awesome MIDI controller. Like most controllers, the KeyStep can be connected to your computer and integrated with your DAW of choice. Once connected, you can play individual notes, set it to arpeggiation mode for free-flowing arpeggios, or switch to sequencer mode for you know what. As mentioned in the features above, these sequences can be saved to the onboard memory, with info like gate length and swing also saved digitally. This information can then be transmitted in 1 of 3 ways: USB, MIDI and CV/gate. This means you can use the KeyStep to control your DAW, your MIDI compatible devices and your analog gear – no matter how old it is. Despite its unassuming size and simple layout, the KeyStep can very easily become a pivotal part of any rig – Eurorack, home recording studio, portable synth setup – the lot. Leading on from our previous point, yes – the KeyStep does Eurorack. Any modular, semi-modular or desktop synth for that matter. You’ve got MIDI out, which allows straightforward communication with most synthesizers nowadays, but it’s the CV/gate connections that really open the possibilities. On the rear panel, you’ve got pitch, gate and mod connections. Each one sends a controlled voltage with its respective purpose. You’ve also got sync in/out, which sends a universal clock signal for synchronising with just about anything. With these 5 x 3.5mm connections, you can easily hook up your KeyStep to 5 different modules at once (if you want to – as long as you know what you’re doing!). That’s why it’s been so popular amongst synth enthusiasts; it’s a relatively cheap, intuitive solution to making music with your modular/analog setup. When people hear the word sequencer, they tend to imagine a row of pulsing LED lights, repeatedly zooming off in the same direction like an airstrip at night. A little box with all manner of knobs, connections and flashing colours indicating tempo, pitch, decay, input signal. Perhaps a series of sliders to determine the pitches/frequencies of each step. Then there’s the KeyStep; a fully-fledged 64-bit sequencer that’s in the form of a nice neat keyboard. Suddenly, the idea of a sequencer isn’t so scary. Literally press the record button, hit the notes in the order that you want them to play, then press play. You can add rests and ties with the tap of a button, or change the timing subdivision with the turn of a knob. You can even tweak or remove notes while the sequence is playing – simply by tapping the keyboard again. This makes the KeyStep the perfect introduction to the world of sequencing with synths. As mentioned above, you’ve got 3 x CV/gate connections on the back, each of which could send a controlled voltage to a different unit if you wanted it to. You’ve also got the sync in/out connections, allow you to send and receive a clock signal. You’ve also got 16 MIDI channels to play with. You can use 2 at once, provided you have some sort of MIDI hub or splitter. For example, if you connect the MIDI out to a MIDI splitter, you can send a sequence to one synth, then switch to MIDI channel 2 and use the keyboard to play a melody over the top – without interrupting the initial sequence. On top of that, you can still have the CV connections sending info to other modules, as well as sending MIDI info via USB to your DAW if you like. Nuts. Being an Arturia device, the user interface is streamlined and easy to navigate. On top, you’ve got a rather reserved 8 buttons, 1 switch and three knobs. But this small selection of controls packs plenty of power for you to easily interact with your music. A huge part of the power of the device is in the shift key. It sounds obvious, we know, but it unlocks a whole lot of secondary functionality. For example, you can hold shift and switch the keyboard functionality between transpose and play; this means you can either transpose the current sequence to a different key, or you can freely play over the top of it (provided you have a polyphonic synth or softsynth). You press shift and record to append your sequences, i.e. add extra notes onto the end of it to increase the number of steps – great for polyrhythms. Hold shift and tap the zone on the keybed that’s marked swing to adjust the swing percentage – it’s never been this easy! The arpeggio mode knob doubles up as your saved sequence bank. Record a sequence while the knob is at 1st position, and it’ll remain there unless specifically overwritten. This means you can effortlessly recall sequences simply by changing the position of said knob – great for saving ideas or performing tracks with multiple sections! The KeyStep can take a 9V power supply, the same as many similar devices, like guitar pedals. That having been said, the KeyStep is a low-power device – this means it’s quite happy being powered by USB, despite all of its fancy functions. Power it from your laptop or desktop computer, plug it into a generic USB plug point – you can even power it with an iPad using the Apple camera adapter! At just over 42cm (19”) wide and 15cm (6”) long, the KeyStep is easily one of the most compact keyboard controllers on the market. When you combine that with its lengthy list of features, it becomes clear how this little unit made such a name for itself. Carry it under your arm, pop it in your rucksack, or tuck it neatly into your setup without taking up heaps of space. The KeyStep comes in at around the £100 mark. It’s not the cheapest MIDI controller available nowadays, but it’s arguably the most affordable arpeggiator, sequencer, MIDI keyboard and analog synth controller rolled into one. In fact, we’d go so far as to say it is the most affordable with all of that in mind! 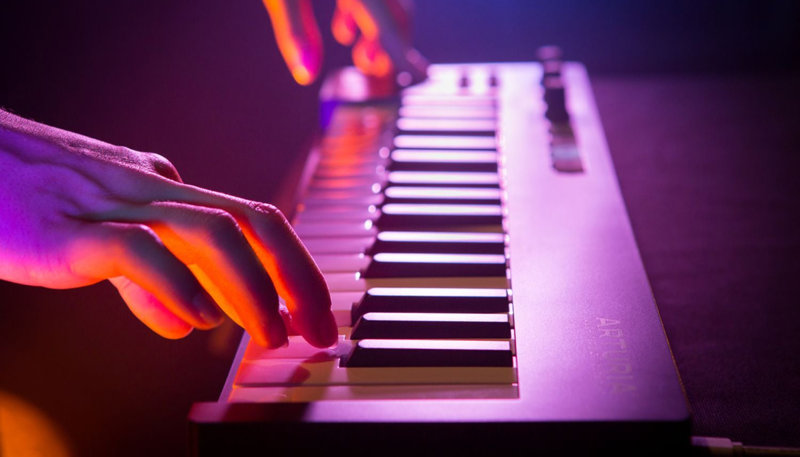 This writer is a little biased; as a guitarist who’s recently been bitten by the synth bug, the KeyStep has proven invaluable. Having the keybed as my primary user interface for controlling and sequencing has made everything far easier than I could’ve imagined. If you’re in a similar position, or you’re looking to change the way you make music – from Logic Pro to Eurorack – I cannot recommend the KeyStep enough. That said, there are plenty of controllers on the market with numerous features to choose from. Check out some popular options below, or click here to view our full MIDI controller range. Enjoyed this read? Why not check out the rest of our learn content while you’re here?